Baton Rouge Water Company has enhanced its email billing offering by enabling customers to easily sign up for recurring payments, directly from the attached eBill. This means faster and more reliable payments for Baton Rouge Water Company and convenience for its customers. 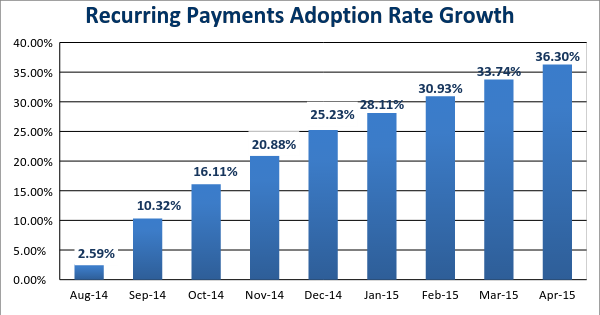 The payment solution, powered by Striata and payment partner, Speedpay (a subsidiary of Speedpay® service (A Western Union Company)), has experienced an adoption rate growth of 36.30 percent from the period of August 2014 to April 2015 and a 9.78 percent increase in payments made through the eBill. Once a customer signs up, every month thereafter, the customer’s payment is processed on the day the company’s bills are distributed. The customer then receives a payment confirmation via email. “The recurring payment feature has streamlined the process for our customers. It has also re-defined our “Platinum” customer, by allowing them to receive an eBill and have recurring payments facilitated from a credit card. The only maintenance required, occurs when the customer has to update their card details,” says Hays Owen, Senior Vice-President and Chief Administrative Officer of Baton Rouge Water Company. “By getting more customers to enroll in recurring payments, Baton Rouge Water Company can be confident of improved cash flow as a result of bills being paid faster. It is evident that customer convenience is key to driving adoption of any eBilling and payment process and this has contributed significantly to the success of the solution. We look forward to helping Baton Rouge Water Company further reduce its payment cycles and DSO,” says Papanicolaou.